At the minster hill, in the heart of the historical old town of Basel, you will find the "Rheinsprung", one of the oldest lanes in the city, linking the cathedral's place to the landing place, the "Schifflände". Historical buildings like the ancient university (one of the oldest in Europe), the "Blue House" domiciling the administration of justice and economy as well as much more other mysterious small houses and narrow alleys (for example the "lane of the eleven thousand maidens") border the building No. 6 "Zum Waltpurg". Even Paracelsus, famous physician and philosopher, was working for a while in this qarter of Basel. it weathered the big earthquake of 1356! Its backside is a natural rock, a geological emnant of the old courses of the Rhein (from east) and the Birs (from south). During many years we managed the renovation and redecoration of the building, respecting to all different details. In the upper floors are located the official registered office of Abraxas, the Abraxas meteorite laboratory and some small workshops where we polish and stamp sealing waxes, fill ink bottles, cut goose quills and work at meteorites. In the ground-floor is the Abraxas shop, with its 10 square metres perhaps one of the smallest in Basel! 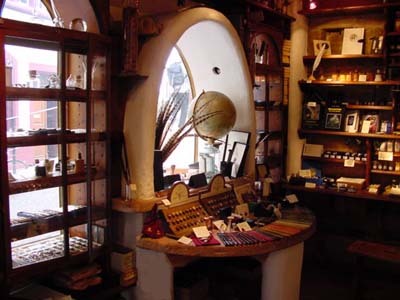 Here you will find our traditional and very extensive assortment of products for calligraphy, fragrances and meteorites. Fans of calligraphy will find over 100 different colours of finest writing and drawing inks, made according to traditional methods (for example oak gall inks, saffron ink, gold ink). A choice of hundreds of antique rare writing pens will thrill many calligrapher's heart just as our unique and legendary sealing waxes, available in 55 colours. A visit in the Abraxas shop can also open a door to your sense of smell... with precious essences, fumigating candles and bath-salts. But the "true heaven" you will see if you are looking for a genuine meteorite. We can offer a simply wonderful choice of these extremely rare and scientifically very interesting extraterrestric objects. On the occasion of own searching expeditions in the deserts and through exchanges with collectors and institutes all over the world, we are able to tender some hundred different meteorites, tektites and impactites... for each budget! Of course you receive a certificate of authenticity for each specimen. As a special service we create your individual designs and colours for sealing waxes, inks, etiquettes and finest personal engravings... or perhaps you need a special mixture of fragrances or you wish a meteorite, faced as a gem... we do it for you, whenever possible! A fine selection of technical literature complete the shop's assortment. Now you are invited with pleasure to visit our "achemistic" shop at the Rheinsprung. Dive into the wonderworld of Abraxas... our competent team would be happy to advise you.